Experience the history of the Berlin Charité during the era of National Socialism through interactive video art. The REMEMBER app accompanies you on your journey through the Charité campus in Mitte. The app leads you to six memorial sculptures and opens up artistic perspectives on this dark episode of history. "It all started with a slight shift in the mindset of the doctors"
The Charité in the National Socialist Era and Potential Ethical Transgressions within Modern Medicine. "Science and social responsibility" tackles a fundamental question regarding conditions and attitudes that can lead physicians to act in an ethically questionable and inhumane manner. During the National Socialist period of history, members of the Berlin Medical Faculty willingly contributed to the bio-political goals and ideological machinery of the Nazi regime. As such, Departments and institutes at the Charité and the Friedrich Wilhelm University were transformed into extremely efficient centers of racist Nazi doctrine in which human extermination became an integral part of medical practice. 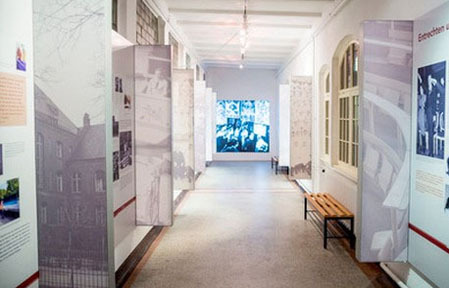 This exhibition comprises of nine on-site campus locations, which exemplify the actions of those involved whilst documenting the transgressions of science and medical practice that took place in the Nazi era. The mentally ill quite often deviate from societal norms in their behavior and are therefore stigmatized. Even into the 20th century, psychiatrists themselves linked heritable criminality and moral defects with mental illnesses. In the NS era these conceptions legitimized sterilizations and the murder of the afflicted. At the Charité, psychiatrists prepared numerous reports of suspected “hereditary illnesses,” leading to forced sterilizations. Children deemed “incurably” mentally ill and “ineducable” were sent to killing centers. The director of the psychiatric clinic of the Charité, Max de Crinis (1889-1945), played a significant role in this extermination of “life unworthy of life.” He also worked to secure funds for the accompanying “euthanasia” research. Up to the present the female body has served as a screen for moralizing societal attributions. In comparison with the male body, the female is frequently described as deficient. In keeping with the biological view of humankind, under National Socialism women were reduced to biological features of heredity and race. They were expected to bear “hereditarily healthy” children in order to strengthen the “body of the people”. Up to forced sterilization and forced abortion, the female body was subject to assessments based on “race” and hereditary health that were justified by science and held as progressive by many medical professionals. The Women’s Clinic of the Charité and the University Women’s Clinic under Walter Stoeckel (1871-1961) also conducted sterilizations. The University Women’s Clinic alone conducted at least 129 forced sterilizations between 1934 and 1944. Universities are spaces of education and intellectual exchange. Values and convictions brought in by students or conveyed by instructors will affect professional activities and disciplinary knowledge. It is often students who criticize the political system of their time and advocate for change. Even before 1933, students at the University of Berlin, including medical students, advocated for racist-populist social concepts that were exclusionary and authoritarian. They saw themselves as representatives of a “politicaluniversity” and of a national revolution. They threatened and drove out those with different political views and supported the racist “ethnic cleansing policies” of National Socialism. The student initiative “Against the Un-German Spirit” culminated in the book burning on what was then Berlin’s Opernplatz on May 10, 1933. Medical findings are sometimes rooted in the practice of conducting research on corpses. Students gain essential topographical and morphological knowledge through dissecting a body. In the encounter with the dead they gain a first experience of the balance between professional distance and empathy. In the era of National Socialism the anatomical institutes acquired corpses of victims of NS-specific injustice and used these for research and teaching. Because the autopsies took place without the consent of those concerned, thereby violating their final repose and human dignity, they must be regarded as ethically problematic from a contemporary perspective. At the Berlin Anatomical Institute, the director, Hermann Stieve (1886-1952), conducted research on the bodies of executed women from the Plötzensee Prison. Children form an especially vulnerable patient demographic and therefore receive special protections. While “hereditarily healthy” boys and girls were supported during the National Socialism era through “preventative health management,” “hereditarily sick” and “ineducable” children were seized and killed as part of the “euthanasia” initiatives. After 1939 the director of the Charité Clinic for Children, Georg Bessam (1884-1944) tested TB immunizations on children who were “unworthy of life.” Large and painful abscesses (collections of pus) showed up as a result; at least ten children died because of the experiments. Children between the ages of two and 15 were chosen for the studies. Many had been born out of wedlock and had grown up in orphanages without relatives. Academic independence does not necessarily stand in opposition to an entwinement with politics and society. In National Socialism, however, doctors and researchers, among them members of the Berlin medical faculty, let themselves be used in service of the political-ideological and military goals of the regime. At the same time, scholarly approaches that contradicted National Socialist ideology were neglected or forbidden and respective institutions were closed. The “Law for the Restoration of the Professional Civil Service” of April 7, 1933, marked the beginning of a nationwide wave of firings of public servants who were undesired for reasons of “race” and politics. By 1938 the University of Berlin and the Charité had discharged more than 160 members of the medical factory and an unknown number of other employees.